Vibrant paper collages accompany a simple yet lyrical text to highlight how many birds live. The focus is on the feet of the birds, but much more is shown about their worlds. For example, most birds must be conscious of their surroundings and wary of any predators in their vicinity. It’s great that the reader is made aware the birds’ lives are not all fun. The swan’s webbed feet help her get closer to the water plants that are her diet. The heron’s long legs and toes help her get a view of the fish she hopes to catch. The roadrunners strong feet and legs help her catch lizards for lunch. Woodpeckers can climb to the grubs they love to eat. 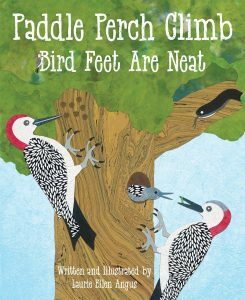 Small flexible toes help the cardinal perch to eat berries and help the towhee scratch for insects. Owls have powerful feet that help them catch prey. The Explore More sections make this a valuable book for nature study. Activities and resources are abundant. 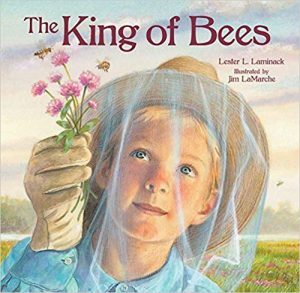 In a short, entertaining story about Henry, who lives with his Aunt Lilla, the reader learns about both bees and family. The author manages to tell a riveting story without being too scary and imparts information without being didactic. The reader will come away loving bees and hoping the bees survive. The two live in Lowcountry South Carolina and struggle to make ends meet. Henry wants desperately to help his aunt in any way he can. He’s just a little young for some of the activities that appeal to him. He helps gather the eggs and quickly learns not to break any of them. He watches as his aunt tends her beehives and is fascinated. Aunt Lilla explains how the bees live and how they also work hard. When the bees swarm, Henry tries his best to make sure none of the bees leave him or Aunt Lilla. He’s learning to bee talk. Anxious moments occur, but it all turns out well in the end. Beautiful illustrations accompany and help tell the story. Even the end papers add to an understanding of Henry’s world. Recommended for a unit on nature or conservation. Great spark for further exploration. The flora and fauna of the earth are not only beautifully diverse but also interdependent in magnificently complicated ways. The author shows that interdependence in simple terms, highlighting food chains and ways usefulness goes both ways. She also shows how man’s shortsightedness has contributed to the elimination of some vital species. As a zoologist, the author maintains that extinctions need to be stopped. Wonderfully rich and detailed illustrations show just how busy the earth is, with over two million species identified over the years by humans. Even the end pages get into the act showing many, many plants and animals. Enough of the text is familiar (elephants and oak trees) to catch a reader’s attention, while enough is new and unusual (Galapagos rosy iguana and microbes that make volcanic lakes brightly colored) to spark curiosity and further research. 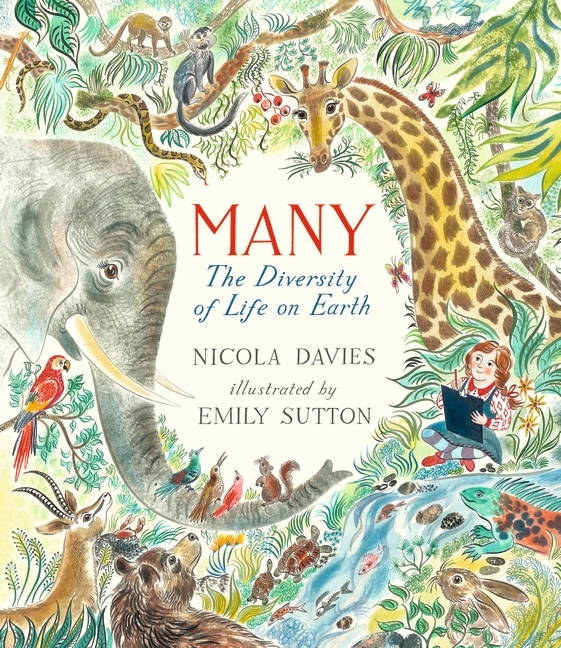 Recommended for the classroom and for at the home of a budding biologist. One of the many methods for passing along information about the Underground Railroad may have been the rhythms of the plantation blacksmith. 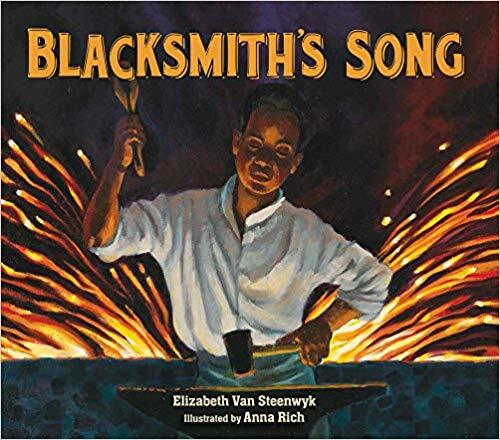 This is a heartwarming look at how a young boy would have perceived the actions of his blacksmith father. It will help the reader identify with both the conductors and passengers on the railroad. Late into the night, Pa swings his hammer, giving the passengers direction. As an excuse, Pa tells his master he’s working on a special birthday present for the mistress of the plantation. Pa is an artist with the iron, forming a beautiful gate topped by a bird. When Pa works himself ill, the boy must take the hammer and pound out the rhythms, at risk to his own well-being. Finally, his family takes a journey of their own. The beautiful illustrations add to the feel and demonstrate the darkness, fear, and hope associated with the railroad. Pa’s creations are reproduced stunningly. Besides the iron bird, he produces a star for the boy, pointing the way to freedom. Recommended for use with history units, musical studies of spirituals, or as independent reading. It should spark many discussions and suggest many projects. 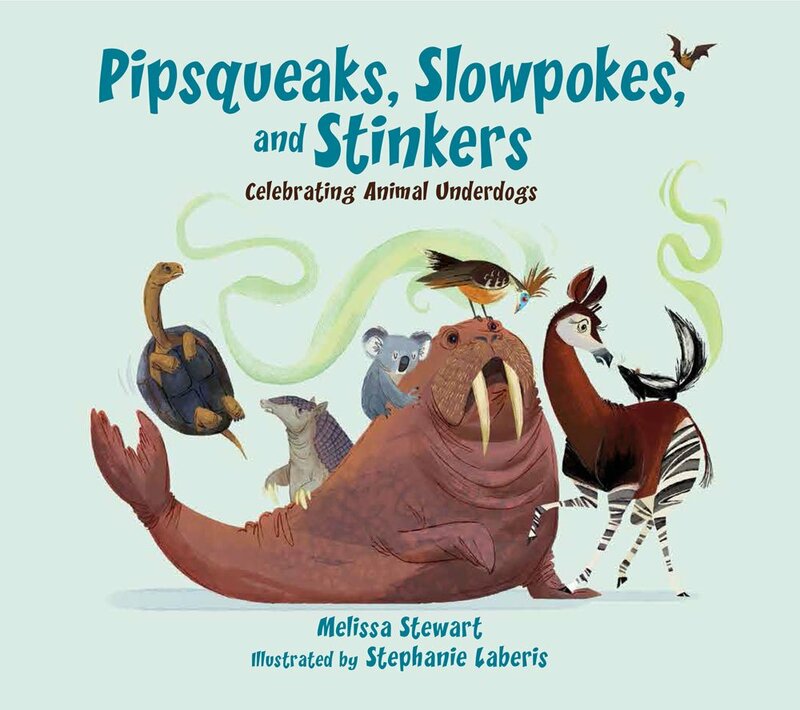 The theme of this cute new book is that even the non-elephants deserve our respect, if only for the ability to survive. That ability is a combination of camouflage, ability to hide, and other factors. Playful language make the concepts fun. Accurate and detailed illustrations make them easy to understand. Etruscan pygmy shrews and Amau frogs are so small they escape predators by slipping into holes and cracks. Galapagos tortoises are incredibly slow but can hide inside their strong shells. The hoatzin, a bird, and the zorilla, a weasel relative, scare predators away with their awful smells. The okapi is known for its ability to hide in plain sight. Koalas, giant armadillos, and brown bats get an edge by sleeping a lot and not needing a lot of food. The western fence lizard is so fast, it can catch any number of spiders and insects. It can also lose its balance a lot. Walruses rely on their blubber to keep them warm and act as storage for lean times. Naked mole rats and perfectly adapted to their desert burrows. More information about each animal is available in the final section. A fun way to learn about animals that may not be featured in your favorite movie. 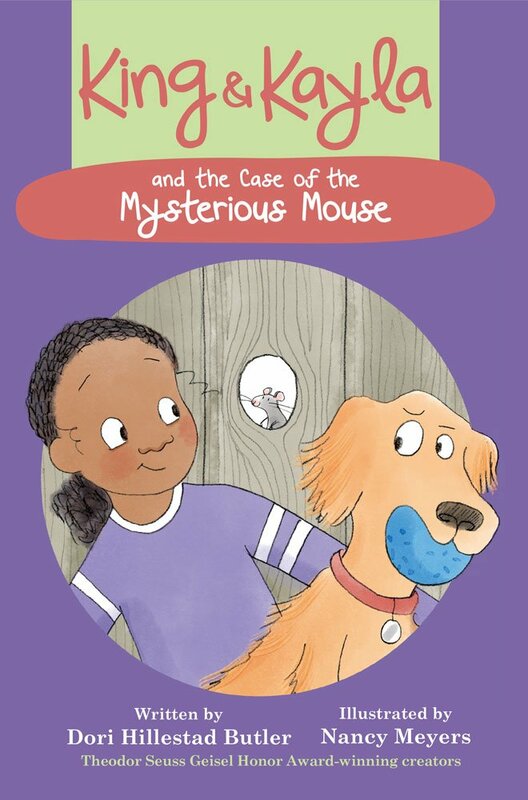 Kayla and King are busy solving a mystery again in the third installment of this wonderful series for young readers. King is playing ball with a puppy when his ball gets thrown over the fence. In trying to recover it, they find many other balls, but not King’s. He meets a cat who tells him “Mouse took it.” How could a mouse take a ball larger than itself? The girls list all the clues they know and all the things they don’t know. Then King figures out who Mouse is. What’s great about this series is that there are enough illustrations to help move the story along and enhance a young reader’s ability to figure out the words. The story is exciting and complicated enough to make the reader think a bit. And the language is simple enough to be readable. Plus, it’s humorous. Recommended for reading together, reading aloud, and independent reading. In her usual subtle and gentle style, the author tells a heartwarming and fundamental story of longing and companionship. There is very little text, so most of the story is told through the vivid illustrations. When a young girl begins singing to the world, she gets no response. “La,” she sings to the air, to the leaves, to a lake, and to plants. She even tries to climb a ladder to the moon. She wears herself out singing, and still she gets nothing. She eventually falls asleep. When she wakes up, someone else is singing “La! La! La!” It’s the magical face in the moon, shining and singing away. This can be viewed as a simple story of the girl finding a new friend, but so many other themes enter with each reading. As a read aloud or for independent reading, this is a wonderful book to add to any collection. Although most people know about Don Quixote, few know much about the author behind the icon. 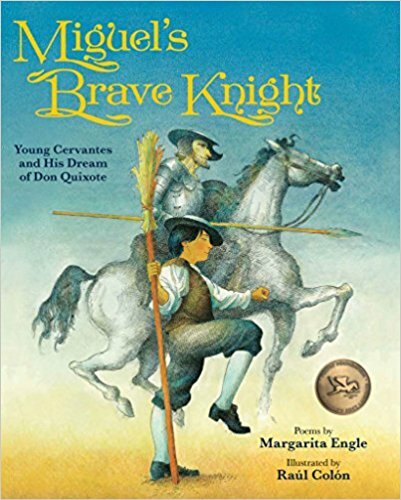 In this fictionalized account of Miguel Cervantes’ early life, the reader learns that Miguel had a very tough life indeed. Escape into his fantasies about Don Quixote was often the only happiness in his world. 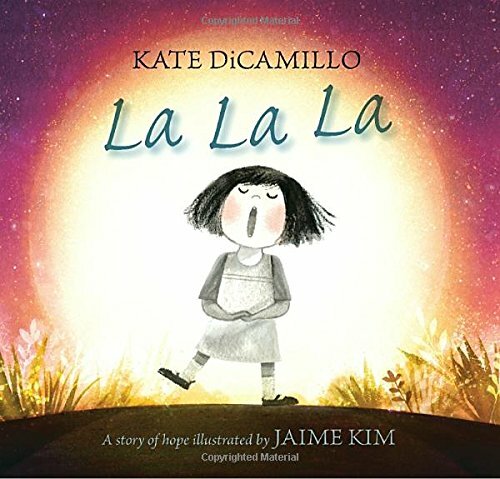 In simple language easily accessible to early grades, the author tells of Miguel’s father who lost most of his earnings to gambling and ended up in debtors’ prison for a time. So the family moved around a lot. Miguel found refuge in the stories his teachers read from books so precious only the teachers were allowed to touch them. Miguel witnessed burning of some of the books considered subversive due to use of imagination. The plague hit Europe, causing more suffering for the Cervantes family. Eventually, Miguel learned enough about writing that one of his teachers asks to publish some of his poems. Fantastic pen, ink, and watercolor illustrations accompany every page of the manuscript. Realistic and authentic, they are certainly as enjoyable as the text. In the Notes, the reader learns of Miguel’s later life. Nothing got easier. He was taken as a slave, was freed, and spent time in prison himself. Getting to know wild animals is easier if you know how they are like you and the domesticated animals you are familiar with. In the area of sounds we make, the author first explores which animals make the noise known as a grunt, because aardvarks do not bark. Who would have thought this included aardvarks, river otters, Hamadryas baboons, white-tailed deer, and oyster toadfish? Animals that do bark include New Zealand fur seals, common barking geckos, capybaras, barking tree frogs, and woodchucks. Animals that squeal include European hedgehogs, Atlantic spotted dolphins, Abert’s towhees, margays, and you. Other sounds explored are whines, growls, bellows, and laughs. The main text is written in simple language that can be read independently. The sidebars are also very simple, straightforward, and relatable. Kids will learn a ton and enjoy doing it. The fun and lively illustrations bring the animals right into the reader’s world. Many of the animals discussed are unfamiliar, so the accuracy of the illustrations is important. Recommended for classroom and home. 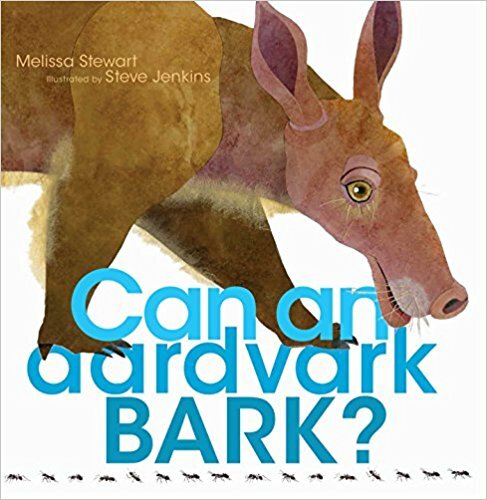 Title: Can an Aardvark Bark? 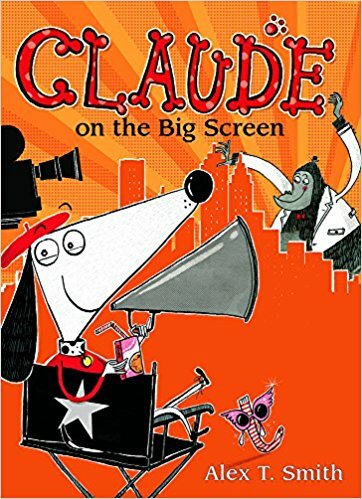 Another installment in the “Claude” series sees Claude and Sir Bobblysock participating in the film industry. In a way, this story is custom made for Claude, a dog, and his sockly friend. It’s silly and imaginative and defines suspension of disbelief. Claude attempts to keep all manner of paraphernalia in his beret, including a clothesline full of costumes. This becomes important, as the line itself keeps snaking its way out of the hat. When Claude notices a giant gorilla in a dressing gown drinking a cup of tea, he and Sir Bobbly sock feel compelled to investigate. They find a film company shooting a movie. They immediately immerse themselves in all things cinema, helping with wigs, makeup, costumes, sound, and lighting. Claude’s clothesline causes a disaster that sends the lead actors to hospital, so Claude and Sir Bobblysock also try acting. Much of the humor is very subtle, but kids will no doubt look for the signs on the buildings (e.g., Miss Reed’s Read-A-Lot Bookshop: We like big books and we cannot lie) and names such as Waggy Avenue. Of course, some of the jokes are beyond young kids (Gloria Swoon), but they will still get that there is humor there. There is a lot here to encourage kids to keep reading. Also, a lot of fun.